The story of the Eastern Conference Finals was the speed both teams possessed, and how that element was going to make for a fast paced, back and forth series. 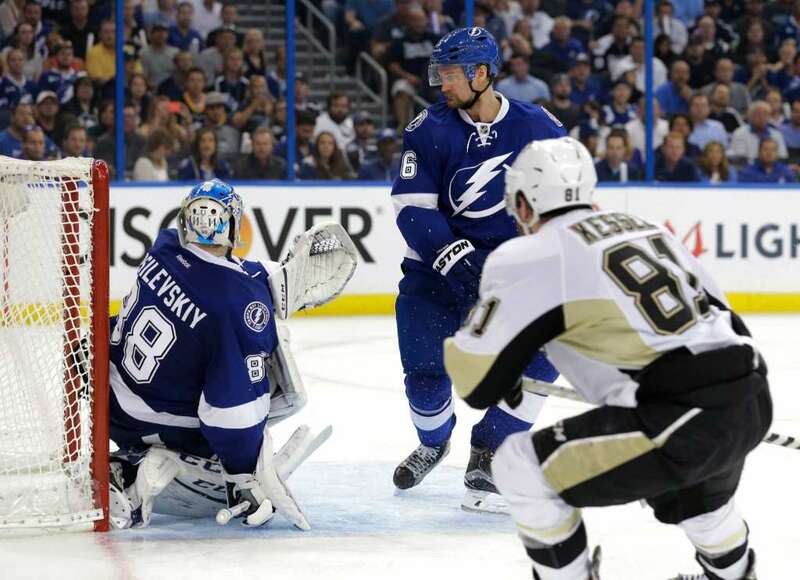 After 3 games, that story has turned into how much faster the Penguins are than the Lightning, and how that advantage has helped Pittsburgh look like a dominant team after controlling the play in Game 2 and Game 3. The shoe is on the other foot for a Tampa Bay team that has been used to having their team speed give them a decided edge over their opposition, and it's led to them sitting back and being pinned in their own zone for long stretches of time. Over the past 2 games, the Pens enjoy a 130-83 advantage in shot attempts, or 61.0%. While the Lightning have received strong goaltending from Andrei Vasilevskiy in relief of the injured Ben Bishop, that's not a trend that can continue if the Bolts want to advance to the Stanley Cup Finals. And another challenge before Tampa is that they need to figure out how to do something that other team has done yet: slow down the HBK line. The Carl Hagelin-Nick Bonino-Phil Kessel line came together in the wake of Evgeni Malkin's injury against the Columbus Blue Jackets on March 11, and they tore through the regular season before proceeding to do the same in the playoffs. Over the last 16 games of the regular season, both Phil Kessel (6g, 10a) and Nick Bonino (5g, 11a) were point per game players, while Carl Hagelin (7g, 7a) wasn't far off with 14 points. Not much has changed in the postseason either as Kessel leads the team with 16 points (7g, 9a), Bonino is 3rd with 12 (2g, 10a), and Hagelin is 4th with 11 (5g, 6a). That means over the past 30 games, the HBK line has combined for an astounding 85 points, and it's little surprise that the Pens are 24-6-0 over that stretch. Of course, slowing down the HBK line might be a case of picking their poison for the Lightning if Sidney Crosby continues to heat up. Though he only had 2 assists against the Capitals after recording 8 points (3g, 5a) against the Rangers, Crosby has points in all 3 games against Tampa Bay including the game winning goal in the past two. If Crosby can start taking over games the way only he and few others can, it's going to further make like difficult for the Bolts. Consider also that Evgeni Malkin finally snapped his scoreless streak and joins Crosby in that rare class of game changers, and the prospect of all 4 lines clicking on all cylinders should be frightening to the remaining Cup contenders. - Jim Rutherford has been named a finalist for the GM of the Year Award along with Brian MacLellan of the Washington Capitals and Jim Nill of the Dallas Stars. It would be the 2nd time the Penguins have taken home the award in its short existence as Ray Shero won in 2013 - the last time Pittsburgh made the Eastern Conference Finals. - It's been a a postseason to remember for rookie netminder Matt Murray. In addition to posting a 0.928 SV% and 2.13 GAA, his 9 wins are now 4th most in Penguins postseason history. - Patric Hornqvist took a shot off his glove late in Game 3, but he practiced this morning and is expected to play in tonight's game.